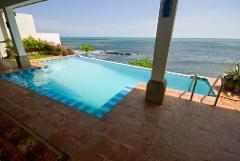 Casa Mallen located at the Carazo beach of La Boquita sits high on the cliff overlooking the ocean. With a large open area and a spread out floor plan this house is perfect for entertaining and is just a little over an hour from Managua. Rancho Santana is located along the Southern Pacific Coastline of Nicaragua and is one of the largest resort developments in the country. Enjoy the privacy of your own home with the amenities of a country club. 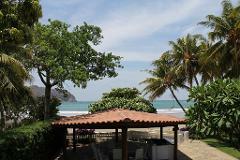 Located in the neighborhood next to San Juan del Sur called Talenguera this home is just steps from the beach. 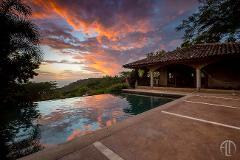 With 4 bd / 4 ba and a large pool this is a great entertaining home just a few minutes from the heart of San Juan del Sur. Casa Sol y Mar is a beautiful beach from property located in San Juan Del Sur and one of the few homes with direct access to the famous bay. 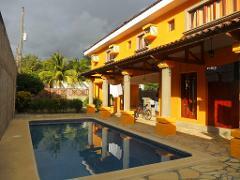 This charming beach cabin is located in the calm and peaceful bay of Miramar just north of Managua and close to Leon. Come experience a lazy beach town lost in time with nearby surf and fishing. Tours of the salt flats also available! Casa Hacienda Vista del Mar, is available for short and long term rentals, is perched along the ridge line in the Bella Vista section of Rancho Santana, with dramatic views of both the ocean and the mountains from nearly every room. Casa Bay View is located high up on the hill surrounding the crescent shaped bay of San Juan del Sur with modern day construction, clean lines and incredible ocean views. Casa Genesis is a charming home located in Granada close to La Calzada, Restaurants, Churches, Bars and more. This Spanish style colonial home has a pool in the center courtyard along with 4 large bedrooms. 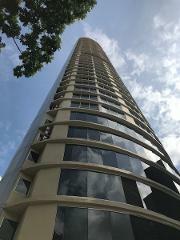 Sleeps 10 -12 comfortably. 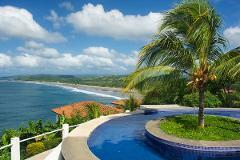 Finca Las Nubes is an organic farm overlooking the pristine bay of San Juan del Sur. 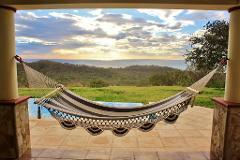 Enjoy a fantastic vacation in this wonderful area of Nicaragua.